As the Ebola outbreak in West Africa continues unabated, there comes a moment of lightness in the form of a bubbly 11-year old boy who beat the odds against the disease. Doctors Without Borders (MSF) relates the story of Mamadee who, despite suffering for weeks with Ebola â€“ the symptoms of which include nausea, fever, muscle pain, fatigue, abdominal pain and diarrhoea â€“ never lost his childish playfulness. 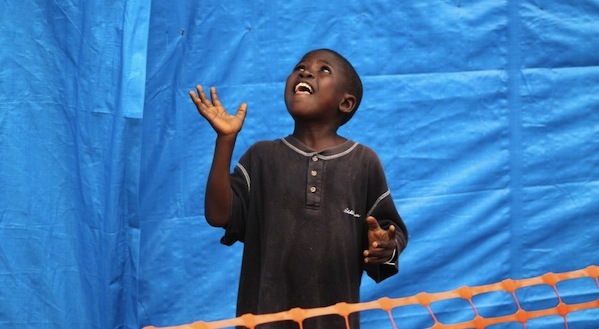 Despite being confined to MSFâ€™s Case Management Centre (CMC) in Foya, Liberia, for three weeks, Mamadee continued to dance to the radio and play with whatever he could find, whether it was a tin can or a water sachet. To many, it seemed impossible that Mamadee could be a patient himself but his blood tests proved otherwise â€“ he was indeed infected with Ebola. â€œHis attitude is definitely exceptional. Every day, the boy spreads a good spirit to the patients and staff. He is always smiling and happy,â€ MSFâ€™s Dr Roberta Petrucci said. Only one in three patients survives this deadly disease. Among the deceased was Mamadeeâ€™s older sister, Mayan, who succumbed to Ebola after a few days. According to MSF, Ebola has claimed 2 461 lives as of 13 September. Mamadee was one of the fortunate few. Read more about Mamadeeâ€™s story here.